A large, nationally recognized construction company was in the midst of managing multiple expansion projects including the construction of data center campuses for a multinational conglomerate. These campuses were being built across the country – each consisting of ten or more buildings per site. It was a huge undertaking to say the least. The company had three sites expanding simultaneously, but the largest was in the Southeast, which employed 1500 skilled construction workers who were onsite every day. The construction company hired a local vendor to handle the necessary temporary structure requirements for the crew, but they were not happy with the results. One of the lunch tents, in particular, was having issues with leaks and the AC wasn’t functioning properly. During rainy weather the tent was drafty and even had water seeping inside the tent due to faulty pad construction. These were certainly not the conditions the company had in mind for the 1500 hardworking craftsmen. They ultimately decided to find an alternative vendor that had a stellar reputation and offered dependable, rapid response to avoid downtime or compromise safety for their workers. 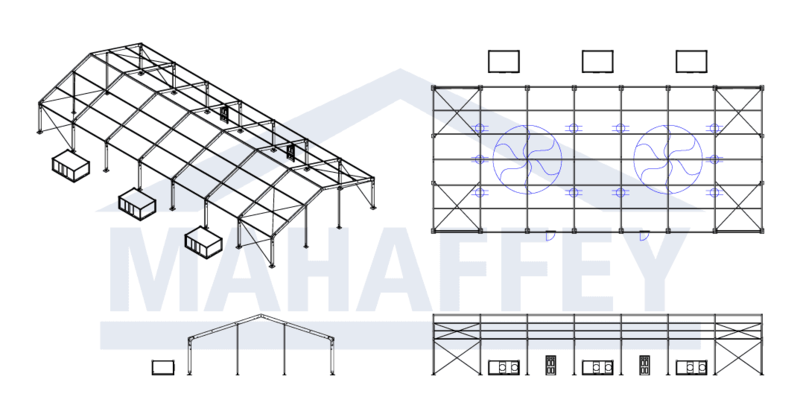 Mahaffey was chosen based on our reputation in the industry, an expansive portfolio of temporary engineered structures and the professionalism of our staff. The construction company was under the gun. They had exacting schedules and any delay meant losing money and man-hours. Their list of requirements began with a lunch tent structure large enough to accommodate a crew of 1500 or more on a daily basis. Additionally, the structure would have to double as a place to hold safety meetings, so it had to be quiet enough and large enough to house the entire crew for an extended meeting. Amenities such as lights and HVAC were also included in the request from the contractor, which are just some of the amenities available with Mahaffey fabric structures. The seasoned Mahaffey team is experienced in providing temporary engineered structures, but the assigned project manager made several site visits to determine the best location and the appropriate product for the job. These visits helped ensure complete client satisfaction and helped the project manager determine the specifications necessary to accommodate the size and needs of the crew. The Mahaffey SuperSeries™ engineered structure was the answer – chosen for its versatility and modular design. The SuperSeries™ is tried and true in Mahaffey’s on-hand inventory of products ready to deploy, and has proven a winner thousands of times for just about every application imaginable. The Mahaffey team arrived onsite for a quick, four-day install. Questions regarding the gravel pad causing the water seepage were addressed on a site visit prior to the team’s arrival with the job site’s grounds maintenance team. The gravel pad was re-graded and the Mahaffey team raised the structure by a foot to ensure no water could seep under the lunch tent structure. Additionally, the team moved the structure’s power source closer to the electrical service which added a level of convenience that was previously overlooked or ignored. The team completed the installation on schedule and the construction team was able to seamlessly transition the lunch tent structures without causing any downtime. The construction crew is currently enjoying the results of the fully functional break tent that was originally intended. The devil is in the details. It’s important to find a vendor to share open and honest communication with you when planning something as critical as feeding your large crew. Mahaffey understands the importance of safe, comfortable lunch and break structures for busy construction crews. 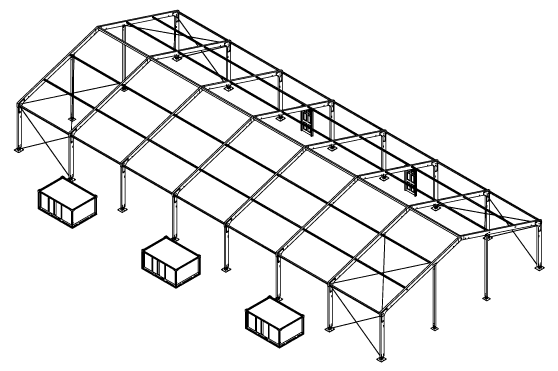 Our portfolio of successful installations includes hundreds of lunch tent structures among them. Our team is OSHA certified and ensures all safety regulations are noted and executed within the customized plan for your project. The next time a big job calls for a strategic, reliable partner capable of out-of-the-box thinking, call one of our expert project managers at Mahaffey.